A Link Between Worlds is the first Zelda game to encourage players to tackle dungeons in the other they choose; producer Eiji Aonuma also teases news of Majora's Mask. The Legend of Zelda: A Link Between Worlds is a bit different from previous Zelda games in that players don't have to go from Point A to Point B to Point C in a predetermined order. 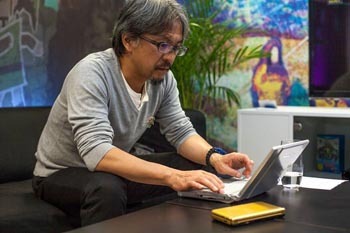 In a Q&A on The Legend of Zelda UK Facebook, producer Eiji Aonuma answered questions about the upcoming game and clarified the changes to Zelda in the 3DS game. Answering a question about the dungeon order, Aonuma said, "In terms of the difficulty level, each dungeon features new ideas involving the item you need to use there, so there isn't some kind of process or order you can follow to make it easier. However, if you are using a particular item more than normal, you will become more used to it, so you may find it easier to complete the corresponding dungeon in that case." By now, it's clear that A Link Between Worlds is drawing on A Link to the Past. Aonuma said most of the enemies in the field are touched-up versions of enemies from A Link to the Past, and some characters are back in the 3DS title with similar roles. Aonuma gives Sahasrahla as an example, an elder who guides Link on his quest. Aonuma answered other questions about the weapon upgrades, the villain, and MaiaMai. Players can upgrade weapons of their choosing. Aonuma personally recommends upgrading the bow, which allows the player to fire 3 arrows at once in a spread. The name of the main villain, Yuga, is derived from the Japanese word for oil paintings. Mother MaiaMai, a large pink octopus-like creature, is "shrouded in mystery," Aonuma said. She exists in both worlds, Hyrule and Lorule. "If you rescue all of the MaiaMai, then you may learn a little more about her so I would encourage you to play and discover this for yourself." Lastly, Aonuma ends the Q&A with a statement on Majora's Mask in regard to fan requests for a remake. "It's nice to see such a strong response to this title, and we haven't forgotten about Link's adventures in that world." Aonuma said. "If you play A Link Between Worlds, you may better understand what I mean by that."